24th July 2016: Glasgow was the scene for some top-class hockey in the U18 EuroHockey Youth Championship II. The host nation fans went home delighted following Scotland victories for both the boys and the girls, while France girls stood at as a potential tournament favourite. The opening match of the girls’ tournament was the Girls Pool A contest between France and Lithuania, and it was the French who emerged as the victors with a 4-1 win. Yohanna Lhopital opened the scoring early from open play, scoring the first goal of the tournament. Albane Garot doubled France’s lead from a penalty corner on the 20th minute. Lithuania pulled one back seven minutes later through Kotryna Kartanovic and the first half ended 2-1 to France. Yohanna Lhopital scored to quick goals in the second half to put the French out of sight and the game ended 4-1 to France. Wales boys took on Ukraine in the opening game on Pitch 1 and it was an end-to-end competitive battle. Ioan Wall broke the deadlock from a penalty corner in the 27th minute then Oleksandr Lipskyi equalised just three minutes later. Wales again took the lead just after half time through Rhys Bradshaw and then on 53 minutes Ukraine levelled the scoring again through Yurii Dzemukh. 2-2 full time. Austria girls secured a 2-1 victory over Italy in a tight game. The first half ended goalless and it took until the 44th minute before Lisa Maurer opened the scoring for Austria. Ten minutes later and Helene Herzog doubled Austria’s lead from open play. Federica Carta pulled one back for the Italians with ten minutes to go but the Austrians held on to start their Euros campaign with a win. Scotland boys were the first host nation team to take to the pitch when they played France. The Scots got off to a winning start through goals from Joe Waterston and Owen Jenkins-Garcia giving the Scots a superb 2-0 win over France. It was a confident and assured performance by the home nation in front of a vocal local support. Austria boys followed on from the earlier Austrian girls’ success by recording a 2-1 win over Russia. Oleg Kotkov opened the scoring for Russia in the 23rd minute and Austria quickly responded through a goal by Luca Frischauf. Fabian Unterkircher gave Austria the lead just before half time with a goal from open play. Igor Shilkov picked up a green card in the second half for Russia but there were no more goals, and Austria boys got their tournament off to a winning start. Scotland girls left it late to secure a dramatic 3-2 win over the Czech Rep despite having most of the possession throughout the game. From the penalty corner, Anna Kolarova smashed the ball low into the net to give Czech Rep the lead. Morven Cawthorne made it 1-1 from the spot after a foul in the D. Maddie Cleat scored after half time and Kolarova equalised instantly for the Czechs. 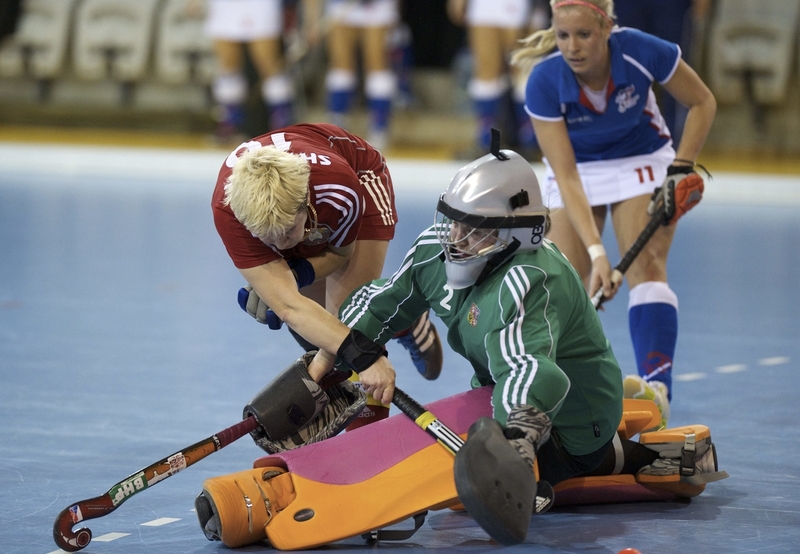 Ella Watt scored in the last minute to give Scotland the victory over a stubborn Czech side. The last game on Pitch 2 saw Poland rack up the goals against Switzerland in an impressive 5-2 victory. Poland’s goals came from Ryszard Wisniewski; two from Albert Wrzesinski; Krystian Sudol; and Jacek Kurowski. The Swiss goals were scored by Tom Hug and Felix Schwander. Poland were leading 1-0 at half time before a second half goal-fest. The final game of the day had Belarus record a fine 5-1 win over Ukraine. Belarus took the lead through Karina Zhuk who tapped the ball home from close range after good build up down the right. Ukraine bagged an equaliser through Hanna Serozhko who reacted quickest from a goalkeeper save. In the second half Belarus turned on the style. Maryna Mandrykava scored a penalty flick; Dziyana Batsiukova added a third on 61 minutes; a wonderful run from Dziyana Batsiukova led to a goal for Karyna Batsiukova; and Karyna Syddykava finished the scoring just before full time.